How Much Does it Cost To Fly To Cozumel? The cheapest flights to Cozumel found within the past 7 days were $89. Prices and availability subject to change. Additional terms may apply. Hartsfield-Jackson Atlanta Intl. - Cozumel Intl. Denver Intl. - Cozumel Intl. Like the strong tides lapping at golden sand, the island of Cozumel is wooing you toward Mexico’s Caribbean coast. While your eyes are still in daydream position, imagine sipping a life-changing margarita on the beach and snorkeling through coral reefs. Laden with archeological ruins and natural wonders, this island is a short float to Playa del Carmen and Cancun, but first, you’ve got to book flights to Cozumel, Mexico. Read on to learn more about our selection of hotels and airfare to Cozumel as well as the amazing experiences that await! Cozumel, Mexico flights touch down just 15 km from the middle of the island, which means you’ll never be far from each relaxing locale on your itinerary, even when you’re on the jetway at Cozumel International Airport (CZM). The easiest way to get around the city is driving a rental car, as public transportation is limited and the tropical landscape just begs to be explored on your own time. 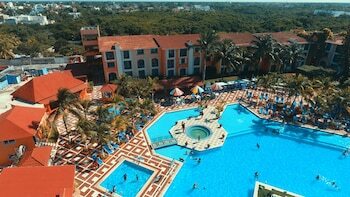 Sunscape Sabor Cozumel – All-Inclusive: Want to stay just steps away from paradise? At this all-inclusive resort, you’ll be a short walk to sparkling Paradise Beach. Admire the coastline from a private balcony or splash around, when you aren’t dining in one of the gourmet restaurants or treating yourself to a massage. 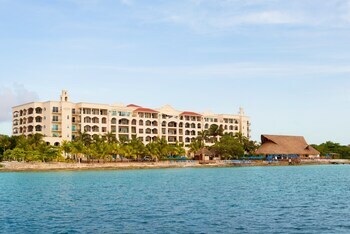 Secrets Aura Cozumel – All-Inclusive: Secrets is known the world over for adult-only getaways. Abscond to the elegant dining rooms, open-air suites, and relaxing amenities, like a full-service spa, five restaurants, and 24-hour room service, when you want a romantic evening in. Wake up to a delicious breakfast and take your coffee for a morning walk on Paradise Beach—perfection. El Cozumeleno Beach Resort All Inclusive: Whether your balcony looks out over a golf green or the crystal-blue Caribbean Sea, you’re in for beautiful scenery. Even the décor takes a few cues from the colorful surroundings with tropical hues. Stay here for a secluded escape and take advantage of the nearby ferry piers and explore the mainland. San Gervasio Mayan Archeological Site: Near the center of the island, explore the ancient ruins of Mexico’s civilizations past. Once the site of pilgrimage to honor Ixchel, the Mayan goddess of love and fertility, San Gervasio is the largest archeological site on the island and its remains stand as a reminder of Quintana Roo’s complex heritage. Beach time: For a refreshing dip on the busy west coast, take your towel to Playa Palancar, where the water is warm and shallow and on a still day you can look straight to the bottom of the sea. Beloved among locals, this is a great place for casual dining right on the water. On the east coast, the rugged shore of El Mirador welcomes you to views of crashing currents and wildlife in their natural habitat. Museo de la Isla de Cozumel: Located directly southwest of the airport in the San Miguel district, this museum is a cultural capsule of the island’s history, art, and folklore. From coral formations and stone implements to contemporary sculptures and model colonial ships, it’s all here. While you’re in San Miguel, listen for the sounds of street musicians and follow the scent of savory seafood to a local restaurant serving up traditional Yucatecan cuisine. Close your eyes and imagine the warm sea breeze dancing across your lashes. Listen for the call of seagulls and savor the possibility of an endless sea. Now, open your eyes. It’s time to book cheap flights to Cozumel with Travelocity, and make your daydreams a reality. Question : Where can I find cheap flights to Cozumel? Answer : We know you’re looking for the best flights at the lowest fares, so we found some of the sweetest deals in town just for you. 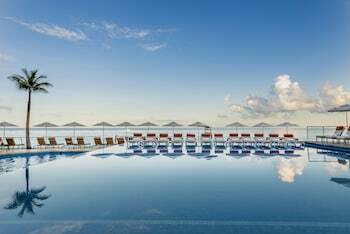 Check out the top flight deals to Cozumel. Act quickly and score yourself a bargain! Interjet has a flight from to Cozumel departing on 5/3/19 and returning on 5/7/19 all for only $485.00 per person. * Book these Interjet flights! United has a flight from to Cozumel departing on 5/17/19 and returning on 5/21/19 all for only $514.00 per person. * Book these United flights! American Airlines has a flight from to Cozumel departing on 5/21/19 and returning on 5/25/19 all for only $615.00 per person. * Book these American Airlines flights! Question : What are the most popular airlines that fly to Cozumel? Aeroméxico Flies 68 flights per week between and Cozumel. American Airlines Flies 35 flights per week between and Cozumel. Delta Air Lines Flies 29 flights per week between and Cozumel. Question : Which hotels are located near airports or major attractions in Cozumel? 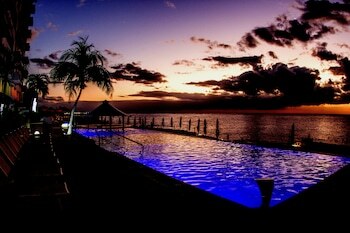 Answer : We've put together a list of hotels in Cozumel close to airports and popular sights to see. Check out the hotels below. 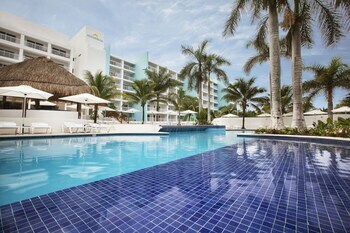 All of them are within proximity to must-see attractions and major airports in and around the city of Cozumel. 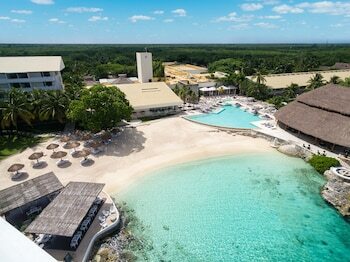 Secrets Aura Cozumel - All Inclusive: Nestled on the beach, this Cozumel resort is within 1 mi (2 km) of Playa Mia Grand Beach and Water Park and Paradise Beach. Corona Beach and Chankanaab National Park are also within 3 mi (5 km). This hotel has a 4.00 star rating. 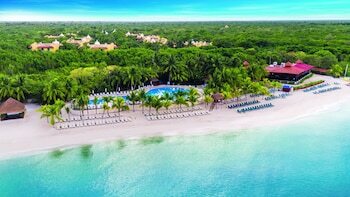 Cozumel Palace All Inclusive: This hotel is set on the Caribbean Sea, 5 miles from Cozumel International Airport and less than 1 km from Punta Langosta, Cozumel's fanciest shopping and dining mall. This hotel has a 4.00 star rating. Hotel Plaza Cozumel: Located in the heart of Cozumel, this hotel is steps from Playa del Carmen Ferry, Punta Langosta Pier, and Central Plaza. San Miguel Church and Museo de la Isla de Cozumel are also within 10 minutes. This hotel has a 3.00 star rating. Hotel B Cozumel: Located in Cozumel, this beachfront hotel is next to a golf course and within 3 mi (5 km) of Cozumel Country Club and Golf Course, Playa del Carmen Ferry, and Punta Langosta Pier. Central Plaza and San Miguel Church are also within 3 mi (5 km). This hotel has a 3.00 star rating. Question : What are the top attractions in Cozumel? 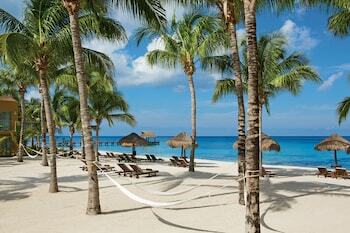 Answer : Cozumel has over 30 points of interest for you to choose from. We suggest checking out San Francisco Beach and Paradise Beach first because they are the most popular attractions in Cozumel. 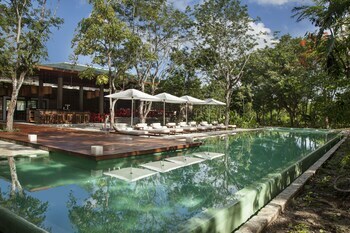 Don't forget about other highly recommended spots like Castillo Real, Isla de Pasion, and El Mirador. Get out there and see what the city has to offer on your trip to Cozumel! 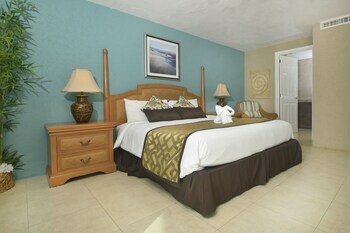 Lovely staff, excellent restaurants, lovely ocean-view room -- a top-notch hotel. Perfect location. Had great breakfast. The pool is small but if you are planning to go to beaches or scuba dive a nice pool isn't very necessary. Overall a very pleasant and relaxing place to stay and the staff were very nice.